Pelham, AL, April 09, 2019 --(PR.com)-- ALSS – QuickTrick Alignment, a local inventor and manufacturer of portable wheel alignment products, will be cheering on as six of the world’s best builders compete against time to build the raddest truck rides seen. 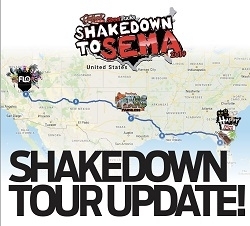 The builders have approximately 6 months remaining to get their rides SEMA ready and hit the road for the #Shakedown tour. The path to SEMA begins in Florida with three stops along the way, including New Orleans, Dallas, New Mexico and then the grand arrival in Las Vegas. “We are grateful for the opportunity to be part of this incredible experience from day one,” stated Tess Winningham, CEO and Co-Founder of QuickTrick. QuickTrick will be providing the official alignment gear for all builders and partnering hand-in-hand with Street Trucks Magazine to ensure the perfect setup for each ride. Builders and their respective builds include Stafford’s Garage in their sweet Chevy Apache, Burley Woods Garage in a 1963 Chevy C10, Full Pen Fabrication in their Ultimate Chase Truck, Overpower Customs with a 1959 Apache, Dark Matter Designs with their daring OBS Dodge Dually and closing out the group with Popeye’s Rod Shop and their beautiful C.O.E. powered by a 24-valve Cummins, air-bagged and journeying atop a completely custom fabricated hauler and bed. You can find out more about the builds and the tour on the website at www.shakedowntour.com. You can support these builds and the event by visiting the same website. Alignment Simple Solutions manufactures QuickTrick Alignment Tools and accessories. QuickTrick tools are designed to improve performance, lengthen tire life through early and fast diagnosis of wheel alignment issues on any vehicle. QuickTrick provides the ability for every enthusiast to complete alignments in the shop, at the track and in the driveway with no lift or level surface required. ALSS QuickTrick is also the founder of QuickTrick Cares, a charitable support group for automotive enthusiasts caring for others and/or going through cancer treatment. We are proud to manufacture in the USA!